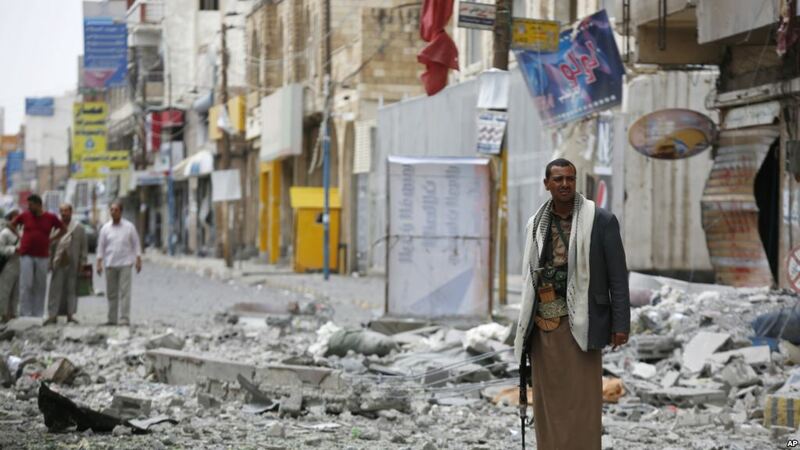 A Shiite fighter known as a Houthi stands guard in front of buildings destroyed by a Saudi-led airstrike in Sana'a, Sept. 5, 2015. Warplanes from the United Arab Emirates bombed Shi'ite Houthi targets across Yemen Saturday, a day after at least 55 soldiers from a Saudi-led coalition were killed in a rebel missile strike. 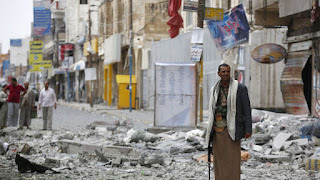 Medical sources at hospitals in the capital, Sana'a, which has been under effective control of the Iranian-allied Houthi militia for almost a year, said about 24 civilians were killed in the city as a result of the attacks, Reuters reported, citing the Emirates News Agency WAM. The air strikes came a day after 10 Saudi troops were killed in the rebel missile attack that hit an ammunition depot in Marib, about 120 kilometers east of Sana'a. That attack also left 45 Emirati and five Bahraini soldiers dead, Saudi media said Saturday, in the kingdom's first losses inside the country. It was the first public acknowledgement by the Saudis that they have ground troops in Yemen, where they lead a coalition targeting the Iranian-backed Shi'ite Houthi rebels and their allies. Friday's death toll was the highest for the coalition since it began its assault on the Houthis in March, and is one of the worst losses of life in the history of the UAE military. The Saudi-led and U.S.-backed coalition, made up mainly of Gulf nations, has been launching airstrikes against the rebels since March, part of an increasingly assertive military policy by the Saudis and the UAE aimed at restoring exiled President Abdu-Rabu Mansour Hadi's Sunni government to power. Saudi Arabia's government is cutting unnecessary expenses and delaying some projects to compensate for low oil prices, though projects that are important for the economy will go ahead, Finance Minister Ibrahim Alassaf said. Alassaf's comments, made in an interview with broadcaster CNBC Arabia during a visit to Washington with King Salman, were the clearest official signal yet that the government was reducing expenditure in some areas as cheap oil slashed its revenues. 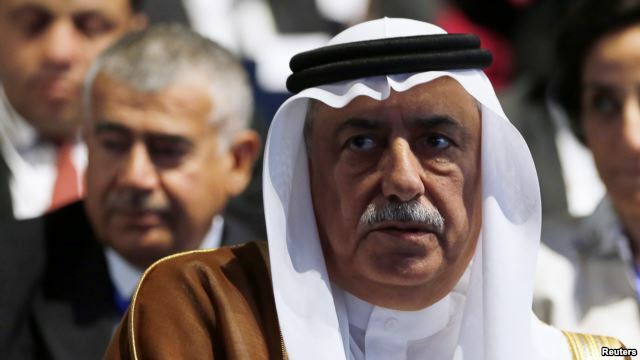 He said the world's top oil exporting country was well-prepared to cope with the plunge of crude prices since last year, and that Saudi policymakers were taking it seriously. "We have built reserves, cut public debt to near-zero levels and we are now working on cutting unnecessary expenses while focusing on main development projects and on building human resources in the kingdom," Alassaf said in the interview, broadcast Sunday. "There are some projects like the ones that have been approved a few years ago and haven't been carried out until now – that means such projects are not currently necessary and can be delayed," he added. "Projects in sectors such as education, health and infrastructure are not only important for the private sector but also for the long-term growth of the Saudi economy." The International Monetary Fund and private analysts have calculated Saudi Arabia may run a huge budget deficit of $120 billion or more this year because of cheap oil. Its financial reserves, which total over $600 billion, mean it is in no danger of running out of money for several years. But the prospect of a long period of low oil prices – and the fact that officials have said little publicly about how they would handle it -- have started to worry financial markets, with the cost of insuring against the risk of a Saudi sovereign debt default rising. Alassaf did not give details of how he was cutting spending. Last December, the ministry said it would "rationalize" spending on public salaries, but analysts believe outright salary cuts would be too politically sensitive to introduce. With Saudi Arabia embroiled in a war in Yemen, security spending looks unlikely to be cut. So infrastructure projects may feel the brunt; for example, a plan to build soccer stadiums around the country has been scaled back, a $201 million contract to buy high-speed trains was canceled, and expansion of an oilfield has been slowed, sources told Reuters in recent weeks. In July, Riyadh began issuing sovereign bonds for the first time since 2007 to help cover its budget deficit. Alassaf said the government would continue issuing bonds and might also sell Islamic bonds, or sukuk, to finance specific projects. "There may be an issue (of sukuk) before the end of 2015, but I cannot say this will continue – it all depends on the need to finance the budget deficit," he said.